Rendering of the new headquarters and youth sports facility at the former Tiger Stadium site. 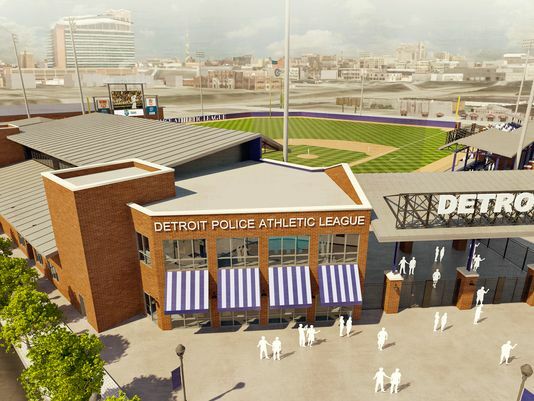 The Police Athletic League (PAL), which will host youth sports at the field in Corktown next year, coined the new name to honor Tigers icon and hometown hero, Willie Horton. The announcement comes before Wednesday’s groundbreaking ceremony for PAL’s new headquarters at the field, which will retain its original dimensions at the corner of Michigan and Trumbull, said PAL CEO Tim Richey. Horton and his family moved to Detroit when he was 5. Two years after winning a city baseball championship for Northwestern High School in 1959, Horton signed with the Tigers. Horton returned to the field in May 2015 to re-create his historic defensive play during Game 5 of the 1968 World Series. Despite strong opposition, PAL plans to cover the field with artificial turf. PAL’s lobbyist suggested police would padlock the gates at the groundbreaking if pro-grass protesters showed up. Detroit Police Chief James Craig disputed that. I always loved Willie Horton when I was a Kid. What made it even better was when he moved his family to our side of town in Rosedale park when I was about 10. Nice man. Great Family too. He had a son that was my sister Ann`s age. people that know About Rosedale Park knows it is a great place to raise a Family. This bring back a lot of great memories for me. Home run again Steve. Thank you.